PCWin Note: Image Video Converter 6 download version indexed from servers all over the world. There are inherent dangers in the use of any software available for download on the Internet. PCWin free download center makes no representations as to the content of Image Video Converter version/build 6 is accurate, complete, virus free or do not infringe the rights of any third party. PCWin has not developed this software Image Video Converter and in no way responsible for the use of the software and any damage done to your systems. You are solely responsible for adequate protection and backup of the data and equipment used in connection with using software Image Video Converter. 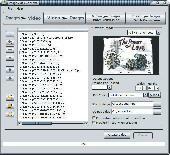 Video to Picture - Video to picture is a Video to picture converter and video capture software. Export picture from popular video formats, you can extract picture list, can also extract separate pictures. 123 Video to Picture Converter - 123 Video to Picture Converter is a professional video to images converter Windows software, just need two clicks you can easily extract EVERY frames to a serious of pictures. Give it a try now. iPixSoft SWF to iPod Converter - iPixSoft SWF to iPod Converter is a lite version of iPixSoft SWF to video converter. It helps to convert Adobe Flash SWF to iPod Video MP4 format file with rich editing functions such as crop, add watermark. ImTOO Video to Picture for Mac - ImTOO Video to Picture for Mac is multifunctional picture capture software to batch extract pictures from various video formats, and save as static pictures, GIF animation, Flash, or HTML. You can preview the extracted images in the picture list. ThunderSoft Flash to Video Converter - ThunderSoft Flash to Video Converter is a professional Flash converter for Flash SWF to video conversion. It helps to convert Macromedia Flash SWF to HTML5 video, AVI, MPEG, iPod/PSP (MP4), MOV, MKV, WMV, GIF and more other popular video formats. Visual Video Converter - Visual Video Converter can convert video files into video clips, audio files and image files visually or capture video clips from your capture device. It supports almost all video, audio and image formats.